As the fallout continues following the deadly Maxima supermarket roof collapse a week ago, Latvian Prime Minister Valdis Dombrovskis has “taken political responsibility” for the tragedy and resigned, taking his minority government with him. 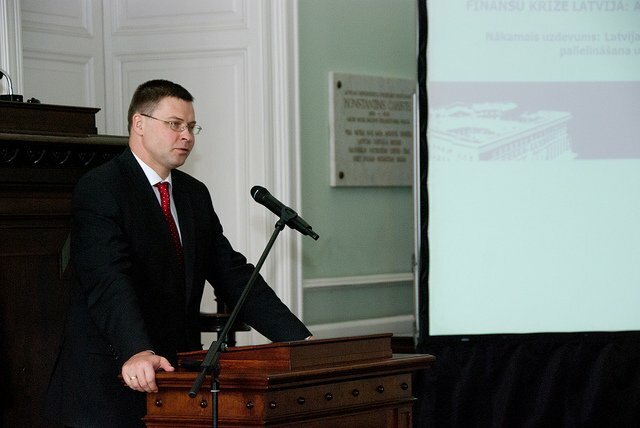 After a meeting with President Andris Bērziņš, Dombrovskis said that Latvia needed a government that had the majority support required to solve the country’s problems. The next election is scheduled for October 2014. Political analysts are speculating that rather than hold an election at this stage it is possible that a coalition of parties in parliament may take control of the country until then. Latvia does not need a sudden lurch into political instability shortly before the introduction of the euro on January 1. Bērziņš has begun meetings with political parties with the goal of forming a new government before the end of the year. Dombrovskis, 42, has been prime minister since 2009. He is widely respected abroad for guiding his country away from the brink of economic collapse to reclaiming the top position for fastest economic growth in the European Union. A day before he resigned Dombrovskis had suggested involving foreign experts in assessing the causes of the tragedy, but Interior Minister Rihards Kozlovskis was known to be against the move.